This week I sent off descriptions for the adventures I'll run at North Texas RPG Con in June. You know what I'm talking about -- those little blurbs you read about each event in the convention program book, so you can make an intelligent choice about which game to play and which to avoid. I enjoy reading other GMs' event descriptions, and I enjoy writing them for my own events. Still, when I write what I consider to be an amazing blurb for an eight-person event and get two players to sign up, it makes me wonder what went wrong. I'm not really concerned about coming up short of players at NTRPGCon -- those folk show up to play old-school RPGs, and there's seldom an empty chair. It has happened at other shows, both for RPGs and miniatures. I moved beyond agonized "maybe they just don't like me" self-appraisals years ago, but questions remain. Another installment of Howling Tower is up at Kobold Quarterly. It's the reply to last week's "Magic is Ruining My Game" -- "Magic is Changing My World." When squeezed for time, DMs are tempted to fall back on the worst solution—a quick and artless nerf. ... The alternative to nerfing is thinking long and hard about the spells in question and their impact on the assumptions we make about our fantasy worlds. The spells that give DMs night sweats are those with deep and subtle ramifications on world-building that game designers didn’t examine thoroughly. It’s the law of unintended consequences at work. The end of our Tunnels & Trolls campaign got me thinking about silliness in RPGs. I don't mean silliness around the table: all the puns, movie quotes, and out-of-character wisecracks. I'm thinking about silly elements that make their way into the game or act as cornerstones for an adventure or even for an entire campaign. 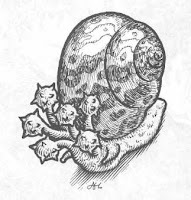 The silliness I'm interested in is gnomes riding on giant shrews, flail snails, heel-kicking leprechauns, talking dogs, Tom Bombadil, and clockwork owls. It's not just comic relief; it's not necessarily played for laughs at all, though it can be. 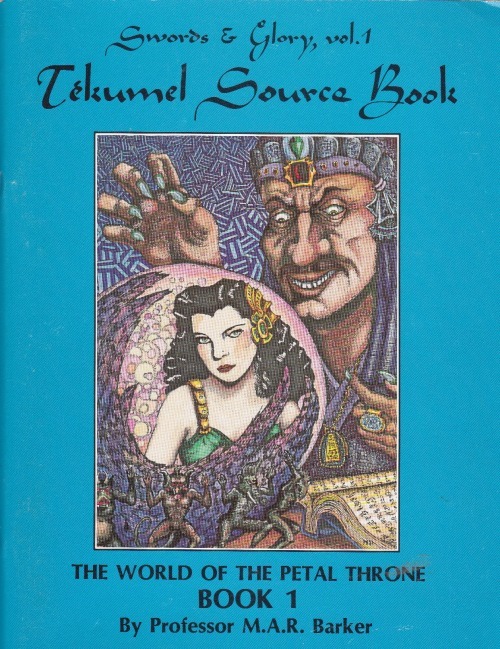 T&T embraces this sort of play more than most other RPGs, which is why it came up recently. I have a vague sense that silliness isn't as common as it once was. That feeling has been around since the arrival of Vampire: the Masquerade, with its emphasis on dark emotions and tragedy. Silliness became distinctly uncool after that. No matter what the DM has in mind, campaigns are defined by the players. On Tuesday evening, we wrapped up a nostalgic Tunnels & Trolls adventure that had been running for several months. It ended with one of those moments that will live forever in group memory. The characters--a dwarf warrior and a leprechaun accompanied by a hapless NPC fighter and a bedraggled wererat--had tracked a villainous witch to the lower level of her dungeon. Eventually they found themselves at the entrance to an underground gnome village guarded by gnomes riding giant shrews. The heroes realized that the village was an alternate exit from the dungeon when the guards admitted that they brought in supplies from the outside world--"seafood, wine, mail, things like that." The dwarf snorted derisively at the idea of gnomes receiving mail, and the gnomes bristled at the insult. They were proud of both the reliability of their postal service and the quantity of mail it carried. The mail service of dwarves was a joke by comparison. Before that argument could go further, the witch arrived with her orc bodyguards and the fight was on. The heroes slew the witch, her bodyguards, and all but one of her gnome allies. Cornered by the blood-spattered dwarf, the remaining gnome asked, "can't we just let bygones be bygones?" The dwarf raised his axe and shouted, "You've got mail, motherf*****!" and split the gnome's skull. Long after the witch's name is forgotten, I'm sure this adventure will be remembered for that tagline alone. Another installment of Howling Tower is up on Kobold Quarterly: Magic is Ruining My Game! "The power to shape reality is what makes magic-users in all their guises such a kick to play in D&D. Ask anyone who's ever owned a monkey's paw or netted a talking fish from the sea, however, and they'll tell you that messing with reality comes at a price. As much as players love having all that cosmos-twisting power at their fingertips, it can be a problem for DMs." Wolf Baur and the crew at Kobold Quarterly graciously invited me to post some thoughts on their site as well as here. The first installment is up today, on Heroism and Lethality in RPGs. I'd like to thank them for the soapbox! Here's a simple question: what's the life expectancy of a D&D hero? D&D's alignment rules have caused a lot of confusion and angst in the past, and that's led to some (IMO) unfair criticism of the system. That's unfortunate; when I first encountered D&D, I thought alignment was one of the cleverer parts of the game. People have problems with alignment, I think, because they misunderstand its parts. That's not their fault; D&D has never done a good job of nailing down exactly what the alignments represent. Confusion in the rulebooks is bound to produce confusion in the minds of DMs and players. Even within R&D, there's always been disagreement over how to define the axes of the alignment diagram. Some people want them to be broadly defined, others want narrow definitions. Some want the categories to be absolute, others want them to reflect local conditions. I've played with alignment in all sorts of configurations and concluded that it works best when the definitions are narrow and absolute. 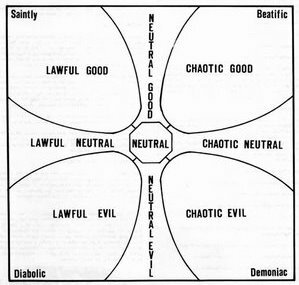 In the beginning, D&D had a one-dimensional alignment scale, with Chaos at one end and Law at the other. This was a direct lift from the Elric and Corum stories by Michael Moorcock. In those, Law and Chaos aren't about legal rules or personal codes. They are the basic forces of the world, represented by opposing pantheons of gods. To say that you served Law meant that you aligned yourself with the gods of Law. You might or might not heed the local laws wherever you happened to be; that's a separate issue. Elric was concerned with Law and Chaos in the heavens because of the way those forces made their presence felt in the world. Once Good and Evil were added to the mix in AD&D, the focus shifted substantially away from the gods to earthly concerns. Gods still had alignments, but they were more window dressing than raison d'etre. Alignments depicted attitudes and no longer reflected the foundation stones of the universe. With that change, it became more important to define the alignments carefully. That never really happened. The definitions were left loose, with plenty of room for interpretation and waffling. Does Good mean you can't lie, or does that fall under Lawful? If I'm Chaotic, does that mean I go out of my way to defy local law, or that I place my own desires above those of others? To clear this up, I propose the following definitions for the alignment axes. This approach was never officially adopted when put forward in the past. With current talk about bringing back two-pole alignment, it's important to have clear, narrow definitions such as these to relieve confusion and frustration. The Good/Evil axis is solely about the value of life. Those at the Good end of the scale believe life has inherent value that should be protected and preserved whenever possible. Good characters aren't reluctant to kill when killing is necessary, but they never kill wantonly or cruelly. Good societies protect innocent life and have systems or traditions to alleviate suffering. Those at the Evil end of the scale believe life has no innate value or sanctity of its own; life is simply something that you have, or you don't have. Evil characters kill without remorse and have no qualms about killing innocents to achieve their own goals. Evil societies might engage in human sacrifice, execute minor criminals as a deterrent to petty crime, or treat murder as a lesser crime than theft. The Aztecs are a prime example of an Evil civilization on this scale, because of their massive institutionalization of human sacrifice. The Law/Chaos axis is concerned solely with respect for social order, not with personal codes of conduct. Those at the Lawful end of the scale believe that everyone must work together for society to thrive and that coercion (law) is often necessary to make that happen. Lawful characters follow local laws (or customs where there is no written law) and expect others to do the same. A Lawful society has codified laws and the means to enforce them. The most Lawful societies extend the protection of the law to the very bottom of the social scale and its restrictions to the very top. Chaotic characters value individual freedom over communal good. They obey laws when it serves their purpose or insofar as they fear enforcement. Chaotic societies might be ruled by the changeable whims of their leaders or by whomever is strongest and most able to enforce their own wishes. If they have a legal code, it is largely ignored, corrupted, or bent in favor of the rich and powerful. The Roman Republic is a prime example of a Lawful civilization. Powerful patricians might bend it to their own purposes, but law was the oil that kept the great machine of Roman civilization turning. Other interpretations are possible and equally useful. What's important is that the definitions are clear and narrow, as these are. This note has nothing to do with D&D or with games, but it does concern my other hobby, a '91 Miata. A team of morons tried to steal it last week. They didn't get away with the car, but they left it in undrivable condition (which is a big part of why they didn't get away with the car; they might have had more success if they'd had a clue what they were doing). The story and pictures of how I undid their handiwork are on my Facebook page.